Just returned from Barcelona to discover Derek Bailey has died. Oddly, the last time I saw Bailey was in Barcelona, playing Abaixadors Deu with the percussionist Susie Ibarra. I saw them having coffee and xocolata on La Rambla the next day, and wish I'd had enough courage to say hello and pass on my thanks ... More so now. He was a hugely important musician, a tireless organiser and figureheard for improvised music, a witty Sheffield man, and writer of one of the great books on improvisation, and music in general. Well played. A fitting obituary by John Fordham and Richard Williams at The Guardian. Likewise Steve Voce in The Independent. This new image of King Kong sitting atop a 1933 New York cityscape is all over architecture and urban sites like a rash, with good reason, and this blog's not about to miss out on the action. It plays entirely to my desires of pausing the film at that point, taking control of the camera, and just wandering about this incredible simulation, possibly with an improvised non-director's commentary. I've mentioned this previously, in relation to Gangs of New York and The Warriors/video games for flâneurs. With Kong, the ravishing pixellated-yet-painterly recreation of a decent chunk of thirties New York is too compelling to ignore. 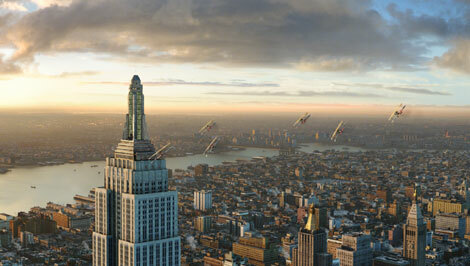 Things mag has some insightful thoughts on the city and architecture generated as a side-effect of King Kong, not least the inspiration of Italian futurist art and particularly Tullio Crali's 'Nose Dive on the City' on the final, famous, fabulous dog fight around the Empire State. (As much as I find that Italian stuff fascinating, I'd have like to have seen some influence of Hugh Ferriss there too - why should Batman have the monopoly there? 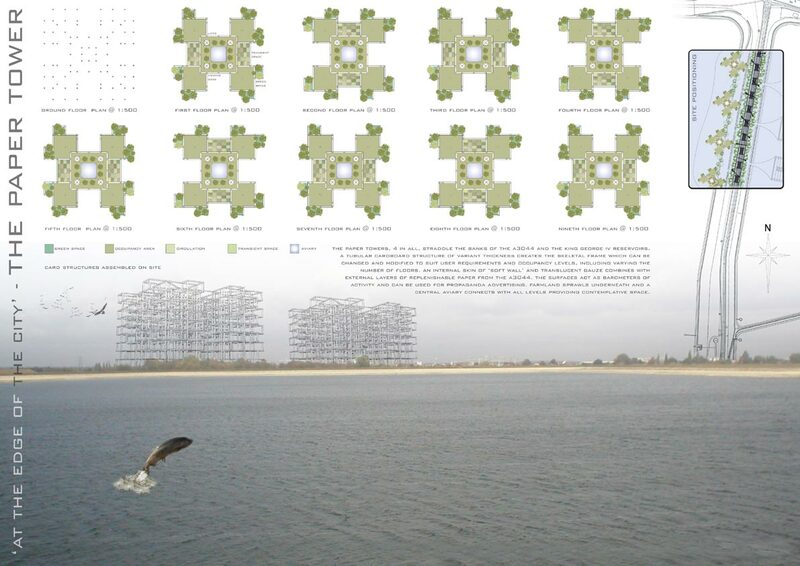 - perhaps that could be a 'filter' we could overlay on to the vicarious urban-architectural experience suggested above?) 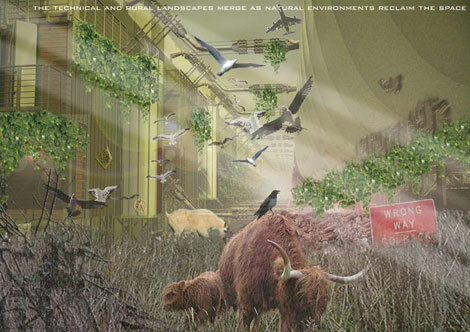 Elsewhere, a new favourite blog - BLDGBLOG - has further interesting ruminations inspired by Kong, on the nature of animal inhabitation of cities - an 'urban natural history' no less (as well as a variant on the film/game/model idea above). Such talk jolted me to post about a project I've been meaning to point to for a while ... Discovered after my recent note on the 'paper buildings' of Shigeru Ban, Alan Morrissey's work for his architectural diploma researched the use of paper-based architecture for sustainable community development, in the context of a piece called 'Demanufacture' [more info on the RIBA President's Medals Student Award site]. His work is interesting on a number of levels - pragmatic and poetic, sustainable and imaginative - but what springs to mind here, given the dreamt evolution of the A3044 and surrounding reservoirs, are Morrissey's beautiful images of the 'trans-species inhabitation' of his architecture, recreating a home for natural forms - birds, cattle, foliage - who would reclaim the environment offered around the lattice-like paper towers. "The space becomes a new form of implied landscape providing a rich array of textures and surfaces. This forgotten place, in turn, takes on a new sustained meaning derived from natural requirements to become useful once more. 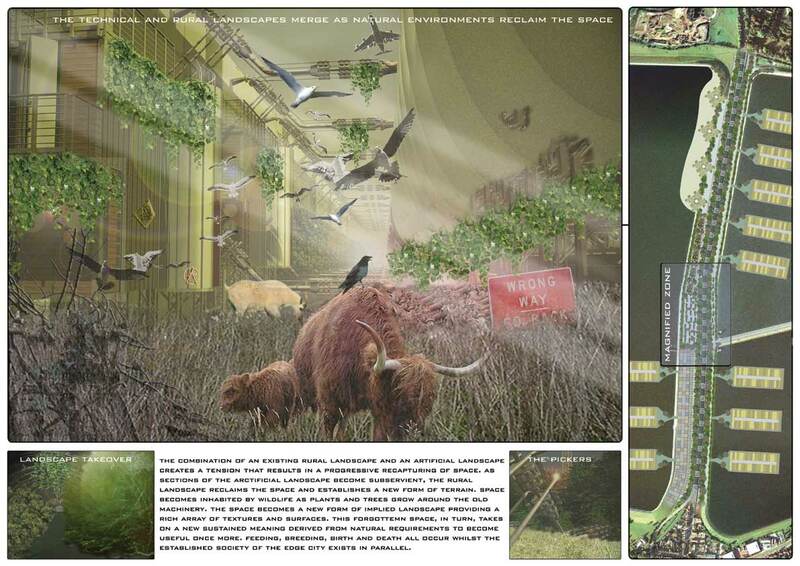 Feeding, breeding, birth and death all occur whilst the established society of the edge city exists in parallel." Whilst not 'deep-urban' as such, with the context of Heathrow airport it's all strangely reminiscent of JG Ballard's brilliant, odd, magical novel The Unlimited Dream Company, which features all manner of fauna and flora in bizarre congress with urban fabric. The permeable form of Morrissey's imagined buildings could enable an extraordinary and profound blurred boundary between people and species various, between artificial and natural, between urban and rural, between permanence and transience. The artist/illustrator/designer, Rick Myers, has updated his site with some recent work, including album art for John Cale but also his recent 'Portable Museum' project for British Architecture Week - more here and Rick's site, Footprints In The Snow, is here. Meanwhile, Paul Schütze's lightboxes are currently on display at Alan Cristea Gallery on Cork Street in London. Image which doesn't really do them justice below! 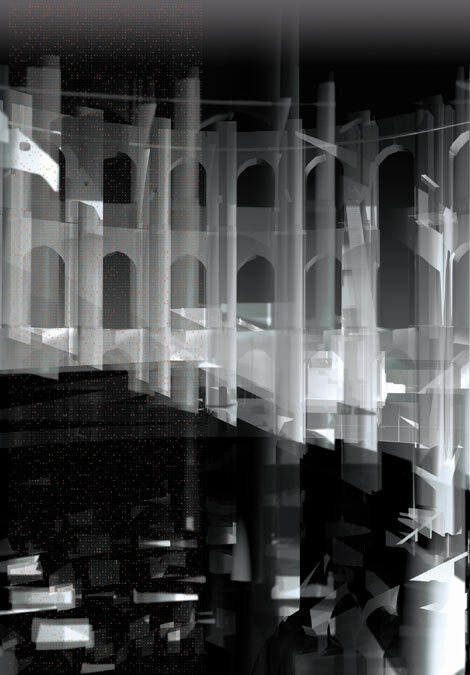 They're a development of his Second Site project on the 18thC architectural structures and astronomical instruments at Jantar Mantar - work which explores the "relationship between architecture, sound, memory and awareness". Well worth visiting if you're in London, plus the gallery has some other recent print-based work from the likes of Richard Hamilton, Patrick Caulfield, Julian Opie, Michael Craig-Martin etc too. A recurring motif here at cityofsound is attempting to draw something modern and progressive from a perspective informed by cultural specificity, local context and history. Easier said than done (and it wasn't that easy to say). News from James Sanders in New York - he of Celluloid Skyline fame - provides us with another example though, from an unlikely source in Architectural Digest magazine. 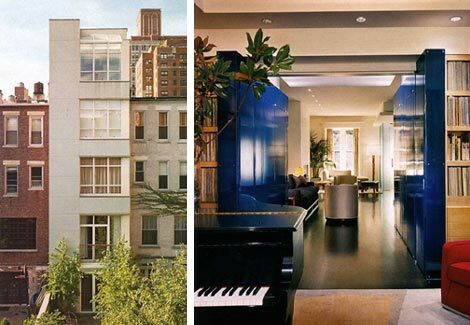 A recent spread featured an East 95th Street townhouse that Sanders and team had recently 'resuscitated', balancing his modernist tendencies with a respect for the classic form of the New York Brownstone drawn from his work with the Landmarks Preservations Committee and the pages of Celluloid Skyline. As AD put it, "though he reconfigured every floor, the architect kept the inherited organization of the house," with the end result that "this Romanesque Revival house that looks so traditional in this historic district has a contemporary soul." Other appealing elements of practice such as multidisciplinary design processes and teams are also invoked, working as he did with Gabriela Herzberg on the interior design from the start. "In what seems an obvious idea but was, in fact, a leap out of conventional architectural practice into the taboo of decoration, Sanders decided to fold in decisions about materials, textures and patterns early into the design process ... The furniture, colors and fabrics would not be an afterthought applied to a stripped white shell but integral to the concept. "We could take clean architectural treatment as a background for a richer, layered environment," he says." I can hardly ignore an article in today's Guardian on the BBC's architecture scheme, having trumpeted it in the past. I can hardly comment either, but the article is well worth a read, covering the recent exit of MacCormac Jamieson Prichard (MJP) from the Broadcasting House (where I work) scheme at the hands of the contractors, Bovis; a similar departure of David Chipperfield from the BBC Scotland project; the inertia over the White City Music Box project by Foreign Office Architects; and the tortuous details of the difficulty of conducting private-sector partnerships in public sector buildings. I sincerely hope that MJP's vision is realised at BH - not for the selfish reason of working there, but remembering how inspired I was by a talk on the project that Richard MacCormac gave at the Royal Academy in February 2004. I've been meaning to post the notes I took that night since then, but never got round to it. Now seems a good time to do it. MacCormac spoke with passion, poetry and pragmatism, talking us through slide after slide of architectural drawing, sketch and photograph, and influencing the way I've since thought about the organisation as well as architecture. I'm posting in the rough, un-edited form in which I took the notes, and I hope they capture some sense of the thrilling vision MacCormac has for the building. After reading Jonathan Glancey's glowing recommendation of the Mario Botta exhibition at RIBA yesterday, I took the opportunity to drop in. It's very special indeed. The architecture would appear to be genuinely beautiful in an awe-inspiring sense - sublime in the original sense of terrifying as much as inspiring, as cathedrals are supposed to (this exhibition - Architetture del Sacro: Prayers in Stone - features eleven of Botta's churches from the past decade). 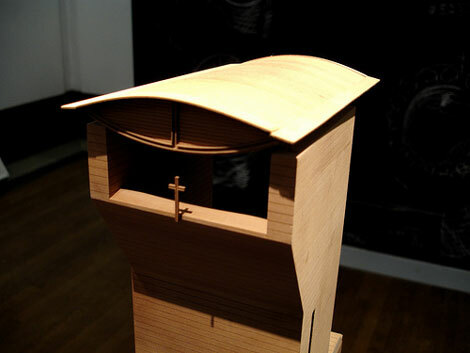 But the exhibition wisely foregrounds the models of the buildings rather than seriously trying to convey the various chapels through photograph or sketch. In this way, one walks away from the exhibition having genuinely experienced the joy of a construction, albeit in miniature. 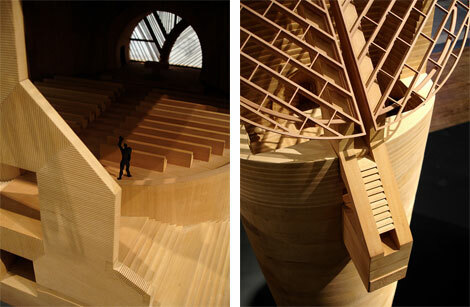 The exhibition may as well be titled 'Models of Mario Botta buildings' such is the attraction of the models themselves. 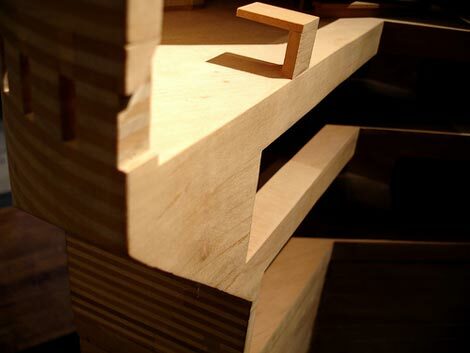 They're delicately crafted in wood and jut upwards from the floor, the base of the external form of the building providing the form of the podium itself. It somehow gives the sense of the buildings emerging from a solid block of wood, sculpted by reducing platonic geometric shapes of cones, cylinders, spheres, cubes. 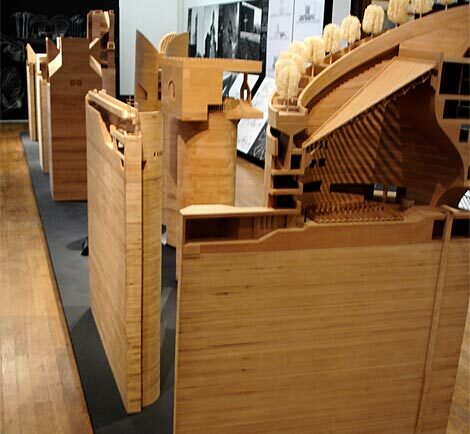 It's a wonderfully simple design solution for an exhibition and unlike computer-printed models, which have their own attraction, they combine real grace, humility and physical presence. Here's some hastily-taken, very rough snaps, which I'm afraid don't convey the delight of seeing the actual models. Check it if you can. "Dott 07 is not about telling people in the North East how to live. On the contrary: its purpose is to enable local people - interacting with inspiring and visionary guest from around the world - to develop their own visions and scenarios. In that sense, Dott is in the acorns business: its most valuable legacy will be the people who stay behind, the projects they have started, and the skills they have acquired to carry them out." The programme looks set to ensure this doesn't become interpreted as a level playing field of populist low ambition, but aims to enable a more participative, adaptive approach in which design is recognised as an everyday activity, engendering agency by building a skillset within reach of everyone, to varying degrees. Very interesting intervention if so. I'm interested in a few more things. Firstly, how the Dott programme will dovetail with the national network of centres for creativity and innovation recommended by the Cox Review. Surely there's a creative overlap to forge there. Secondly, to commend the scale of ambition here. It's great that it's a long-term 10-year programme, rather than actually following the high impact crescendo approach of the Great Exhibition and Festival of Britain, and that it's being developed from within regions, with diffuse strategies of public design commissions, education programmes and design showcases. Thirdly, I'm intrigued as to the subsequent steps after the North East - where next? Finally how it provides another example of how variously wielding the power of the public sector can be allied to innovation in business, following the Cox Review. Lou Rosenfeld's recent comment in response to Dott indicates that the US is in no position to genuinely coordinate creativity in industry. Whilst there's a strong entrepreneurial culture in the US, it's going to be fascinating to see how that holds up - despite all this hubristic Dotcom 2.0 chutney - when faced with countries of similar scale embodied by Brazil, Russia, India and China (BRICs). It may be that the smaller, more agile countries - Finland, Canada, Australia, the Netherlands et al, and potentially Britain, as well as the other South-East Asian tigers - could be flexible enough to work in this context. Dott may help manouevre the UK in such a direction. An industrial policy for creativity. Nearly. I had the pleasure of meeting Sir George Cox for a chat last week. Cox is Chairman of the Design Council, and has recently submitted his review of creativity in British business ("The Cox Review of Creativity in Business: building on the UK’s strengths") in response to the Chancellor's request in his Budget speech earlier this year. We had a wide-ranging discussion, which I found highly interesting and useful - more later, I'd guess - but it's worth dwelling on the Cox Review for a moment. This has to be seen in the context of an increased focus by the Government on design, 'the creative industries' and their role in the UK economy. There are numerous complex contextual aspects to this increased focus from Gordon Brown, and arguments either way as to whether it's simply paying lip-service to this sector, an attempt by the Blair administration's to gain 'cred', or genuine insight and infrastructural support on a vital and thriving component of the British economy (see Nico Macdonald's article for the RSA Journal for a balanced series of views here). However you see it - and personally I'd welcome the focus but be keen to see true understanding and developmental support as a result - the fact that Sir George Cox was commissioned to 'stock-take' and provoke discussion via concrete recommendations can only be a useful thing. In a nutshell, it's a good report. I'll do no more than note a few key findings here, and suggest my own take on it - which I should stress is unrelated to my conversation with Sir George. The full review is available in PDF format via the Treasury website. The context stated in the review, and set by Brown, is the emerging challenge of the 'BRICs' (Brazil, Russia, India, China) in particular, not only in manufacturing industries but also in the informational economies that the post-industrialised West had assumed would be their 'value-added' economic base. This rings true, not least due to being supported by a well-aimed broadside of data. While we've heard these warning signs before - cf. Japan in the '80s - what we know of Shanghai, Mumbai and the like does suggest a fundamentally transforming balance of economic power. To which, the traditional strategic answer had been 'our' apparently more advanced stage of development in the knowledge-based industries. This, however, is not enough. Indeed, the UK's strength in creativity and innovation, not just in the thriving creative industries, is noted in the Cox Review but the general air is of now not being a time to be complacent. Hence the report's recommendations are genuinely infrastructural and development - not simply a case of re-stressing the importance of 'creativity'. The central recommendations address financial support for innovation within business, providing a decent focus on the bottom-line, particularly for SMEs. They're couched in the 'advisory' language of such reviews, of course, and have to navigate the labyrinthine circuits of public policy, but if enacted would certainly help. For instance, Treasury reviews of R&D tax credits should 'consider' changes to increase the effect on smaller businesses. The powerful public procurement sector should be adapted to encourage innovative solutions from suppliers, too - if that seems like a mealy-mouthed recommendation, it's worth noting that this is a UK market worth £125 billion a year in good and services, which can be manipulated to some degree (despite deregulation and a virulent 'value-for-money' meme). Changing the culture of business itself is another arena for the Review, with a range of recommendations running across the business environment, from support programmes for SMEs right up to changing the Institute of Directors syllabus. This might appear tangential or too nuanced but this kind of change management, in the unfortunate jargon of business consultancy, is certainly crucial to the success of any such strategic activity. Switching the hardware without addressing the software rarely works. I've been engaged in work at the BBC recently to look at the cultural changes effected appointing creative/technical staff to senior positions, and it's interesting to see Cox's recommendations like "steps should be taken to get greater understanding of creativity and innovation into the boardroom by recruiting people with creative experience onto company boards" in that context. Closer links between universities and SMEs should be a given, and it would be impossible to deliver a report such as this without making that recommendation. However, putting it into practice is rarely as easy. I have personal experience of the worth of these kinds of activities, via my work at MMU, in the Northern Quarter of Manchester, but Cox rightly notes that UK education needs a root-and-branch upheaval of the way it handles creativity, rather than forcing students to choose between two cultures at such an early age. Again, a clear recommendation but I'd suggest that the problem is a a deeper cultural issue for Britain, with education a particular manifestation within a symbiotic causal relationship. The report clocks this, with a sense that a multidisciplinary emphasis within education would help hugely. Again, from my own experience creating multidisciplinary teams, I'd endorse this. There's a decent discussion of some opportunities for education and business here, and still a sense that "the UK appears to be adept at developing world-class subject-matter experts who too often lack commercial aptitude ... too many great technological ideas are squandered as their creators have little to no idea how to express their inventions”. I hear echoes here of John Kieffer's talk at the Sibelius Academy's 'Future of Music' symposium, in which John noted arts graduates equally devoid of entrepreneurial or business skills (with a notable exception being the YBAs, who somehow emerged as fully-formed artists and business people. More here in John's recent article for AEA Platform). Over and above the suggestions around financial support, business practice and education, the grandest gesture within the Cox Review would be the most significant if delivered with imagination: "A network of ‘Creativity and Innovation’ centres should be established throughout the UK, with a central hub in London." This would mean building actual bricks-and-mortar (and digital, one presumes) infrastructure to support this industry, providing a focal point for the more diffuse recommendations elsewhere in the report and for this kind of industrial and creative development in the UK in general. The proposed benefits will be familiar to those working in the field, from business performance to more nebulous but equally important cultural impact. It's up to the regional development authorities (such as the LDA in London) to deliver these centres, and I'm yet to read anywhere that Brown has committed significant additional money to facilitate this, despite giving it and the Review a thumbs-up in general. If so, a fair amount of advocacy and persuasion is going to be required to deliver a coherent network, one suspects, as well as a commitment to high-quality architecture, integrated with urban centres and cultures. Delivering this effectively will take real skill and sensitive engagement, capable of traversing physical and cultural structures with equal facility and imagination. Personally I'd suggest any such architecture should be a supportive act for a higher goal - the creation of intellectual architecture around creativity, truly enabling networking and business development via information, discussion and support around design in the widest sense, distilled into these physical centres for impact but conceptually and actually far more diffuse. Again, addressing software, in this case social software for business and creativity, alongside hardware. The informational relationships between the buildings and the cities - and the businesses and citizens which provide the life of both - is the real essence of these networks, not the buildings themselves. 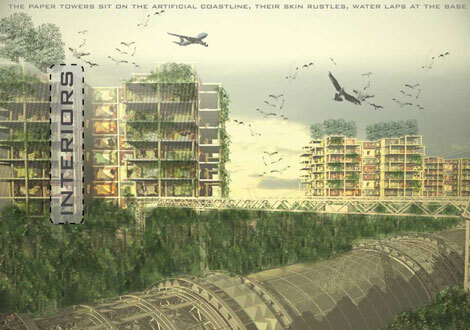 It can also flex, grow and adapt, sustainably, in ways most buildings struggle to. John Thackara makes a similar point. But if constructed in this context, and if constructed well, it should become a transformative, defining act for creativity in UK industry - the one recommendation which compares to that context in chapter one. "The centre will bring together businesses from the ICT and creative sectors in an iconic new building occupying 1.2 million squarefeet, sited in the middle of the ‘Central Xchange’ – one of three ‘Xchanges’ aimed at fostering knowledge transfer and providing a vibrant work-live-work-play environment. The centre is a key component in the country’s aim to increase the contribution of the creative industries to six per cent of GDP by 2012." "What is impressive – and worrying – about the emerging economies is not where they stand today but how they are positioning themselves for the future. Alongside the enterprise and vigour that characterise their economic growth, they arebuilding up new technology-based industries and impressive capabilities in scientific research, and investing massively in education, technical skills and creative capabilities. As a consequence, it is now the high-skilled jobs in the hitherto leading economies that are coming under threat." 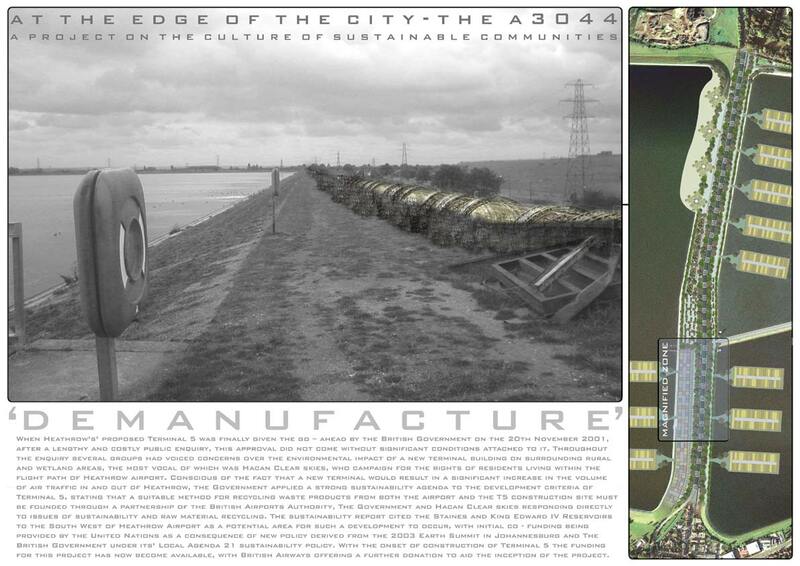 The point is not to necessarily build another Fusionopolis, but to find a truly culturally specific response from within British industry, capitalising on our strong history and rich potential; a response which engages with the BRICs as true partners where possible - importers, exporters, co-creators - as it's going to be difficult to play them at their own game. 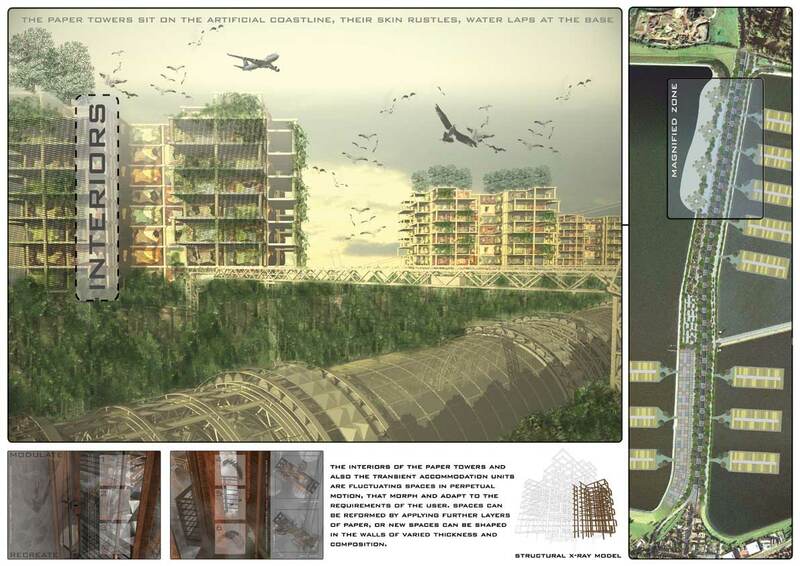 Building something better than Fusionopolis should be the aim, and a smart, sustainable combination of physical and intellectual architecture described above could be just that. In this context, the Cox Review may be correct not to focus too much on examples from the BRICs, and draw instead from our own terrain. "This report has been prepared for the Chancellor. It therefore focuses on the things Government can do to stimulate greater creativity in UK business. And, as illustrated, there are several things I believe can be done. However, the real messages are for business. Competition is going to get tougher. In the modern world, the only answer is to be more enterprising and more creative, and this has to come not in response to exhortation but out of enlightened self-interest. " In asking what you can do for Britain, and not vice versa, the Cox Review sends the right message out to industry but requires a receptive ear at nos.10 or 11 - if not the whole postcode district - to truly take things forward. Cox's team have done their part - will real support emerge as a result? The British knowledge-based industries are powerful, robust and endlessly innovative, possessing a rich heritage from which to draw and a bright future well within their grasp. But it will still require coherent, brave policies creating a fertile loam to nurture growth, delivered with skill, sense of purpose and bold visionary thinking, if we are to have a meaningful stake in the 'harmonious world' envisioned by the Chinese president. We need rich mortar to build with these new BRICs. Savile Row, London. No introduction necessary. So much so that a Japanese synonym for suit is sebiro. However, changes are afoot, which lead one to question how much, ahem, 'brand extension' is possible in urban space, before it loses the sense of identity that created the brand in the first place. For nearly 300 years, the street has been known for a form of quiet creativity and service - indeed, what might be currently known as service design - through bespoke tailoring. That kind of historical altitude often hides incremental change, but recent years have seen acceleration towards perceived new markets and it's too easy to characterise the street as an anachronism, or as a Dickensian vestigial nub on the gleaming form of globalised W1. Of the original tailors on the street, most of which currently remain, Gieves & Hawkes and Kilgour have diversified their business carefully, to retain a sense of their original tailoring brand whilst enabling a ready-to-wear market and attract a younger clientele. They provide an example to much of the street; a microcosm of how the Savile Row area could modify from within. Duffer provided a similar example from another angle - casual becoming smart, if you like. Questionable, but a fringe case. Elsewhere, new British tailors like Ozwald Boateng and Richard James have joined the throng - not without causing ripples, despite their apparent deference to the hand-made tradition. But a creative tension between the original tailors and the new entrants could ultimately be managed in interesting ways. Now, however, the likes of Evisu and Abercrombie & Fitch are pitching up on the street, and the landlord of over half the freeholds on Savile Row (Pollen Estate) has designs on further transformation into "an upmarket, quality retail-fashion area". In other words, not tailoring. According to a recent article in the FT [subs. reqd. ], their mechanism for this transformation now features 40% annual rent increases. Despite consistently full order books, the nature of hand-made production means that bespoke tailors cannot scale to match such an increase. And so, slowly but surely, they're having to move out. Many of the tailors thus see these changes as the quiet death of the street's meaning, and therefore the street. John Hitchcock, father of Stephen Hitchcock, was more than wistful about being forced out of the street by a rent increase, but was already beginning to wonder about whether to look back, other than in anger. "With all these changes, it has not got the same class anymore", he said of the new street emerging. Malcolm Plews, a tailor at Welsh & Jeffrey, grumbles that "these people aren't tailors - they're outfitters", describing Evisu's stocking of two hundred quid jeans as "sacrilege". Of course, progress is inexorable and must be embraced so as to create an ally rather than an enemy. However, the importance of history and continuity in creating a meaningful sense of place cannot be underestimated. Psychogeographic rivers can run deep but when Chinatowns and Little Italys lose their original character, their solid form may not melt into air but their meaning does. Look at the difference between Les Halles and Santa Caterina. The latter's sense of progress from within a framework illustrates how it's possible to preserve the best elements of the past in order to define a future. That 'meaningful sense of place' is what the developers are playing with when they talk of "reinforcing the Savile Row brand", but are they best placed to handle this kind of nuanced brand experience? Rhetorical. London and Britain has long suffered the iron grip of property developers on urban fabric. How is a 40% rent increase going to reinforce anything except the simple displacement of the current tenants? From this distance, this would appear to be another example of how British landlords often reject of the opportunity to combine history, context and innovation, and the long-term economic base that could engender, in favour of a short-term profit which (inadvertently?) changes a place's identity forever. Savile Row is where it is for very pragmatic reasons - situated in Mayfair, the best slot on the Monopoly board (where 'Boardwalk' is on the American version) and therefore close to well-heeled, fashionable customers. Initially, therefore, the relationship between place and space is tenuous and transient. But having been there for a quarter-millenium, it's now in a position to truly reinforce a particular manufacturing and product design base, such that the symbiotically-preserved Savile Row brand enables its small- to medium-sized enterprises (SMEs) to thrive, even in the centre of this most money-obsessed of cities. This is good for the city, the citizens and the companies. And utterly at risk if short-term profit forces out what made the street in the first place. Note again, order books are full - just not as full as those enabled by the high volume production of the incoming global fashion brands. "And of course, if the client is wanting more than just the suit, and desires the full-on, real-time Savile Row experience with all the local history and colour, I happily meet them there at Number 20, where I have my London offices. To me, Savile Row is a proper business, not a tourist attraction. But now my market is global. Some of my customers come to London now and then, but seriously, they live and travel all over the world, and it's my job to keep track of them. However grand and magical Savile Row can appear on an early morning walk, all that's really needed to do the job is skill, a tape measure, a cutting table, a sharp pair of shears and the ability to keep one's word. I'm as happy meeting my clients in a Manhattan hotel suite as I am meeting them in London. Ergo, I’m open for business, anywhere on the planet. Who wants a suit?" This is good news for Mahon, clearly, but to some would question the role of the street as anything other than shop front. 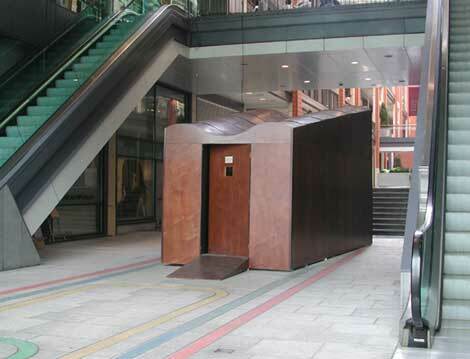 However, despite his apparently utterly contemporary 'global information worker' trappings, through his careful recording of the street's history and characters Mahon knows his ability to sell himself is reliant on being an intrinsic part of the Savile Row experience - the brand, the history, the highly localised particulars of the manufacturing and trade itself. It's something over and above the skill, the tape measure, cutting table and sharp pair of scissors. It's Savile Row. He's smart enough to contribute to this ongoing subtle brand development - though he may not phrase it like that - and therefore take advantage of being able to call his blog 'English Cut' and have the subtitle 'the blog of thomas mahon, bespoke savile row tailor, london'. But if this quiet centre of quality design and service is rubbed out from the area itself, like all those chalk marks currently being daubed on cloth up and down the street, then surely it's a matter of time before the area is tacked on to the rest of W1's global high street - increasingly indistinct from Anywhere Else - and we lose a core component of British cultural capital in creativity and design. If you are no longer able to actually visit Savile Row, and visit "a proper business, not a tourist attraction"; if the meaning of Savile Row is not inculcated into the next generations of fashion and textile students as anything other than history; if we allow those businesses themselves to fade away as a result, unable to compete with waves of global fashion brands, then how much longer will Savile Row mean anything genuinely useful, even as a prime piece of real estate? It ceases to have 'added value' even to property developers in the long term. Ultimately, it's the ability to see that a place is a portrait of a community over time that will enable us to shape our cities and creative industries into forms that fit. Cities and industries as bespoke designs, tailored to their specific histories, will be meaningful globally and locally.